This makes a total of eight awards garnered by the destination over the past five years from this prestigious 60-year-old firm: two gold, three silver and three bronze. 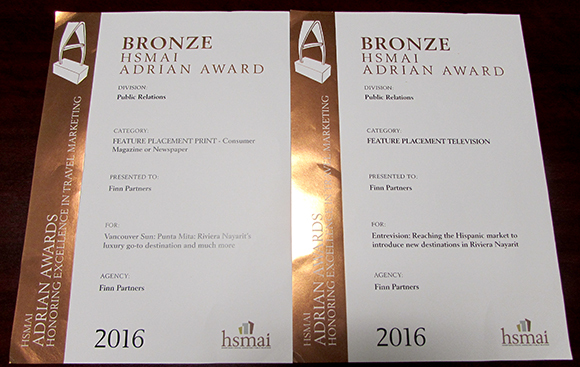 The first day of spring marked HSMAI’s (Hospitality, Sales & Marketing Association International) annual gala dinner, held in conjunction with Diamond Partner Accor Hotels, where they announced the winners of the 2016 HSMAI Adrian Awards. During the event, the Riviera Nayarit took home another two bronze plaques to add to its collection. The new awards were earned thanks to the excellent teamwork by the Riviera Nayarit CVB’s Public Relations office and its North American agency, Finn Partners. One of the awards was received in the written press or magazine category for the article titled “Punta Mita: Riviera Nayarit’s luxury go-to destination and much more” published in the Vancouver Sun and written by renowned journalist Irene Thomas, who was honored with the Mexican Tourism Board's (CPTM for its acronym in Spanish) Award, "Pluma de Plata" (Silver Pen), this recognition is given to journalists who highlight Mexico in their writings, this is undoubtedly a sample of Irene's outstanding work, as well as the affection she has to the Riviera Nayarit. The other award was received in the TV category for the Entrevision production titled Reaching the Hispanic market to introduce new destinations in Riviera Nayarit. With these two there is now a total of eight awards received by the destination over the past five years from this prestigious 60-year-old firm: two gold, three silver and three bronze.